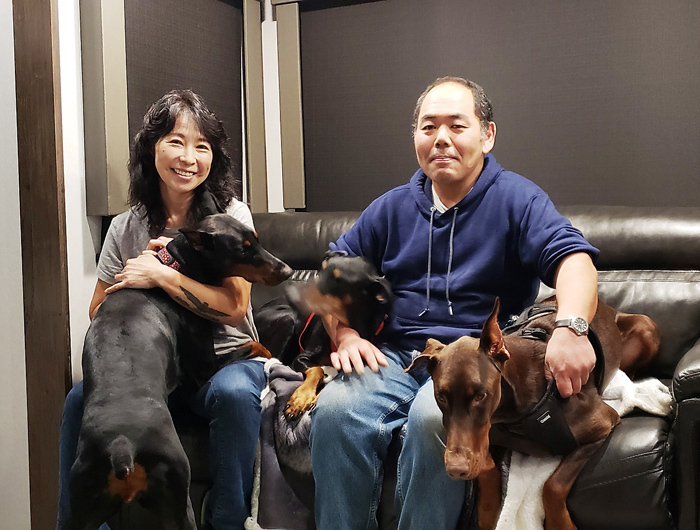 Tomoyo and Shigeo Kojima with their three dogs. Tomoyo and Shigeo Kojima recount escape from Camp Fire on Nov. 8. “I came to America with one suitcase and it’s been 30 years. I got one restaurant, two houses and everything I want. However, I lost everything in a few hours,” said Tomoyo Kojima. 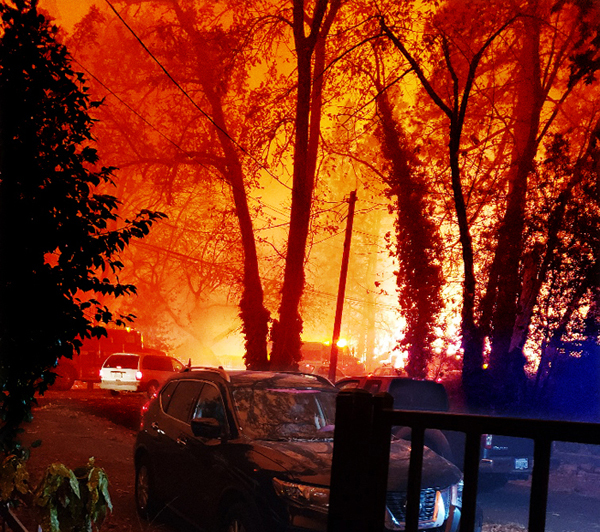 The Camp Fire broke out in Paradise, Butte County, on Nov. 8 and burnt the entire community at a frightening pace. Paradise residents Tomoyo and Shigeo Kojima were forced to flee from their home. They ran a Japanese restaurant in the small town and the wildfire destroyed not only their restaurant but also their two homes. They talked to **The Rafu Shimpo** about the Camp Fire and their frightening experience. “I woke up and enjoyed coffee time while watching TV news. I spent the morning like always on Nov. 8,” Tomoyo recalled. At that time, they never expected that a massive wildfire was approaching them. The town of Paradise, with a population of 27,000, is located about 180 miles northeast of San Francisco. 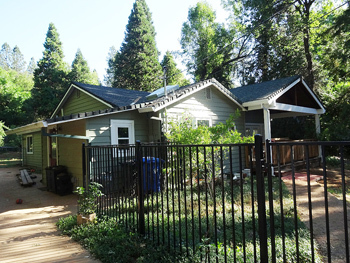 Surrounded by nature, it was literally like “paradise.” Many retirees from the Bay Area moved to the town. Tomoyo is originally from Chiba Prefecture and Shigeo comes from Fukushima Prefecture. They ran Ikkyu Japanese Restaurant in Paradise, which was a popular hangout for locals. Tomoyo looked outside and she noticed that it was really dark outside with ash falling from the sky. Fires are frequent in Paradise because the town is surrounded by nature, so she thought, “Maybe fire broke out somewhere in the town” and didn’t worry about it. In less than 30 minutes, the situation completely changed. The sky was getting darker and burning ash started falling. But they hadn’t received any warning or notification about an emergency. “Don’t tell me fire is coming to my home,” Tomoyo thought, anxiously. Suddenly something orange came into her view and she realized that something was happening that made her not believe her own eyes. Their backyard started burning. She put out the fire with a water hose and noticed that it was extremely dry outside. “I called my husband and told him that he should come back home immediately,” she said. 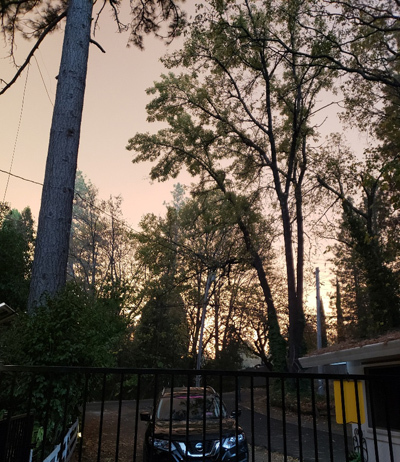 By this time, the Camp Fire had started burning the town with strong winds and extremely dry air. Thirty minutes later, Shigeo came back home. However, the road in front of their house was crowded. There were three roads left for them to evacuate from Paradise — Skyway, Clark Road and Pentz Road. Taking these roads, people can evacuate to the next town, Chico, which is a 20-minute drive from Paradise. Pentz Road is in front of their house, but traffic from the fire scene so traffic was extremely heavy and they couldn’t go out on the road. They felt anxious and afraid. While waiting to evacuate, they poured water on the roof. Eventually, the fire spread to the evacuees’ cars and to the house next door. “WE MUST GO NOW! ” They still couldn’t start evacuating, since traffic at a standstill and the scene was chaotic. A couple minutes later, sheriff’s deputies started guiding their vehicle. They put their three Doberman pinschers in their two cars and finally left their home. Using her phone, Tomoyo Kojima shot this photo of the fires near her home at 9:57 am on Nov. 8. As they evacuated, the scene that they saw was terrible and pathetic. Both sides of the road were burning and they had to drive through the fire. It was in the morning but extremely dark. It was like the deepest forest in the night. They couldn’t see the light in front of their cars and they didn’t know where they were driving. They just drove slowly and fled to the shopping center. Forty to 50 cars evacuated to the shopping center and waited four to five hours there, but they were forced to evacuate again to somewhere safe, since the fire had spread to the surrounding area. Just when she thought, “ I might die here,” the traffic sped up. Bang! Bang! They heard explosions of cars and propane gas as they fled from the town. Those sounds are burned into Tomoyo’s memory, and when somebody closes a car door, the noise reminds her of that terrifying moment. “Finally, we could evacuate from Paradise to the next town around 4 p.m. Probably we were the last group,” Tomoyo said. Some residents are forced to hitchhike when they fled to the next town. The only thing that they could do on that day was take their three dogs and grab a few clothes. The fire destroyed their restaurant, their two houses and their beloved community instantly. The Camp Fire became the deadliest and most destructive fire in California history. As of Dec. 4, the wildfire had killed 85 people and there were 11 people still missing. More than 13,000 structures were destroyed. 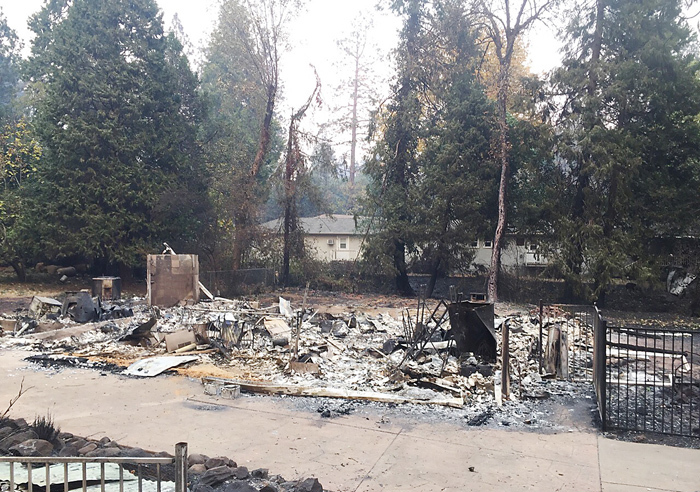 Their home was destroyed by the Camp Fire in Paradise. Is there a Gofundme for Tomoyo and Shigeo Kojima? I’d love to see a GoFundMe for them as well. Could Rafu Shimpo help organize a GoFundMe for the Kojimas?